I’ve been very busy lately, so I apologize for being scarce! I’ll be speaking about the Canon of the New Testament during the next apologetics class at my church. It is a common attack from unbelievers that many gospels were “left out” of the canon of the New Testament. Walter Bauer’s theory was that there was no “orthodox” Christian doctrine. Rather, he argued, Christianity had no common core of beliefs, no body of faith that was passed down and eventually preserved in Scripture. Christianity was a hodgepodge of different beliefs, and what we now know as “orthodox” was merely the viewpoint which achieved dominance and crushed opposition. 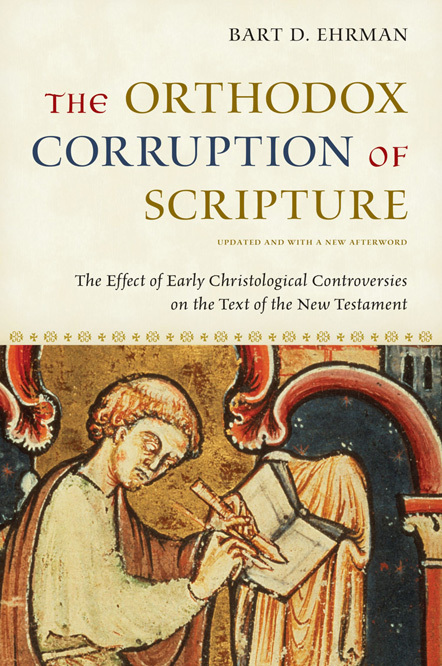 In his scholarly book, The Orthodox Corruption of Scripture, Bart Ehrman applied Bauer’s theory to the discipline of textual criticism. Copies of Scripture exploded throughout the ancient world, and were copied and re-copied by these different groups, each with their own ideas of “orthodoxy.” Eventually, Ehrman argues, the very Scriptures themselves became hopelessly “corrupt” and began to reflect the various views and ideas of all the different groups. If this is something that interests you, go to your local library and grab a copy of Ehrman’s book (or request one by Inter-Library-Loan). Read the introduction, where Ehrman lays out his thesis. It isn’t hard to understand. Anyone can read it. This is important, because Ehrman seems to be the face of liberal Christian scholarship these days. He has popularized his theories about the New Testament in a series of books, including Misquoting Jesus and Lost Christianities. Why does this matter? Who cares? Here it is – Ehrman and other liberal scholars claim that various “heretical gospels” (he wouldn’t consider them heretical, of course – there is no Christian orthodoxy to his way of thinking, after all!) are just as valid as the canonical Gospels we see in our Bible’s today. You’ll hear references to The Gospel of Thomas, The Gospel of Peter, The Shepherd of Hermes, etc. Why were these so-called “Gospels” and other early Christian literature rejected by the corporate church as false, and Matthew, Mark, Luke and John accepted? This is what I’ll be talking about in my apologetics class. Was the work written by an apostle, disciple or follower of Christ? Orthodoxy. Does the work conform to the corporate body of faith? Does it contradict known writings and the teaching handed down by the disciples? Apply this test to the beginning portion of The Shepherd of Hermes. Please note – some early Christian did believe Hermes was canonical. In the end, however, it fell out of favor and was not accepted by the larger community. Leave a comment with any observations you have on why this work was not eventually accepted as canonical Scripture. Think about it. Jot a comment or two down and see what you find. Most people you’ll meet who challenge you with Hermes or other heretical documents have never actually read them. Read this excerpt from Hermes and judge for yourself . . .
1:1 The master, who reared me, had sold me to one Rhoda in Rome. After many years, I met her again, and began to love her as a sister. 1:2 After a certain time I saw her bathing in the river Tiber; and I gave her my hand, and led her out of the river. So, seeing her beauty, I reasoned in my heart, saying, “Happy were I, if I had such an one to wife both in beauty and in character.” I merely reflected on this and nothing more. 1:3 After a certain time, as I was journeying to Cumae, and glorifying God’s creatures for their greatness and splendor and power, as I walked I fell asleep. And a Spirit took me, and bore me away through a pathless tract, through which no man could pass: for the place was precipitous, and broken into clefts by reason of the waters. When then I had crossed the river, I came into the level country, and knelt down, and began to pray to the Lord and to confess my sins. 1:7 I answered her and said, “Sin against thee? In what way? Did I ever speak an unseemly word unto thee? Did I not always regard thee as a goddess? Did I not always respect thee as a sister? How couldst thou falsely charge me, lady, with such villainy and uncleanness? 1:8 “Laughing she saith unto me, “The desire after evil entered into thine heart. Nay, thinkest thou not that it is an evil deed for a righteous man, if the evil desire should enter into his heart? It is indeed a sin and a great one too,” saith she; “for the righteous man entertaineth righteous purposes. While then his purposes are righteous, his repute stands steadfast in the heavens, and he finds the Lord easily propitiated in all that he does. But they that entertain evil purposes in their hearts, bring upon themselves death an captivity, especially they that claim for themselves this present work and boast in its riches, and cleave not to the good things that are to come. Why Trust the Four Gospels? Great Writing . . .